Heterotopic tracheal allografts in small rodents have been shown to share many characteristics with the development of obliterative bronchiolitis (OB) in the clinic and therefore provide a suitable animal model for the study of OB. The model facilitates the examination of the pathogenesis of the disease and the elucidation of the cellular and molecular mechanisms involved in its development. The model provides a less technically demanding alternative to whole lung transplantation in small rodents and should lead to a speedier identification of new treatments that might prevent the development of post-transplantation OB in the clinic. Lung transplantation is the only method currently available to return patients with end-stage pulmonary disease to normal life. The success of lung transplantation has improved since its inception as a result of the introduction of new surgical techniques, improved immunosuppressive protocols and innovations in managing acute rejection and infection. The survival rate of recipients is currently 71% at 1 year and 46% at 5 years . The major complication, which affects about 50% of patients who survive beyond 3 months, is obliterative bronchiolitis (OB) [2,3]. Although the precise etiology is not known, the most likely cause is chronic allograft rejection. OB is a chronic inflammatory disease involving the bronchial epithelium and leading to the gradual obliteration of small and large airways by inflammatory infiltrate, proliferating fibroblasts, mature collagen and extracellular matrix . The syndrome has two distinct phases, an alloimmune phase with lymphocytic infiltration of the bronchiolar structures followed by a chronic fibroproliferative phase leading to partial or total occlusion of the airway lumen (see Fig. 1). The pathogenesis of OB appears to involve a 'response to injury' type of pattern in which episodes of potentially reversible acute rejection lead to the irreversible state of chronic rejection. Acute rejection is induced by repeated immune-mediated injury to the epithelium and can be exacerbated by brain death in the transplant donor, a condition that is thought to activate inflammatory mediators and promote acute rejection . This leads to the migration and proliferation of pulmonary mesenchymal cells, smooth muscle cells and fibroblasts, the release of cytokines and the proliferation of cytotoxic T lymphocytes, causing injury to the graft and leading to connective tissue deposition  and luminal occlusion. These processes are driven at least in part by the growth factors platelet-derived growth factor (PDGF) and basic fibroblast growth factor (bFGF). PDGF and bFGF have been shown to be upregulated in bronchoalveolar lavage fluid from OB patients in the clinic . Putative mechanisms of clinical and experimental obliterative bronchiolitis. The figure details the progression of the injury from epithelial damage to airway inflammation with influx of lymphocytes, neutrophils and macrophages, with subsequent release of cytokines and growth factors leading to myofibroproliferation and gradual obliteration of the airway lumen. Throughout the acute and chronic phases, immune responses have an important role in the pathogenesis of OB. T-helper cells, which recognise class II MHC antigens expressed by the donor, drive the immune response; the resulting antibodies cause acute and chronic rejection . The clinical investigation of OB in humans is restricted by the limited amount of biological material available from patients. This makes the development of a simple animal model that accurately reflects the development of OB in humans a highly desirable goal. Animal whole lung transplant models have been used extensively to study the processes involved in chronic allograft rejection [9,10]. This technique has the disadvantage of being a time-consuming and technically difficult procedure, especially in small rodents, limiting its use in testing potential new treatments for OB. Other disadvantages of the whole lung transplant are that obliterative lesions require a substantial time to develop and are not always evident in these models [11,12]. The procedure also often results in damage to the parenchyma . A simple experimental animal model that mimics the development of post-transplant OB in the clinic would aid in the study of the disease and in the development of suitable treatments to alleviate the condition. Models of heterotopic tracheal allograft transplantation in small rodents have been developed. This technique is less technically demanding than whole lung transplants and allows a greater number of procedures to be performed in a short space of time, helping to reduce variability within studies. Initially, the site of choice for transplantation was the omentum . Hertz et al  then described a murine model in which the trachea and main bronchi were transplanted from a BALB/c donor mouse into a subcutaneous pouch in the dorsal surface of the neck of a C3H mouse. The study demonstrated a simple technique that produced lesions histologically indistinguishable from those observed in humans. The choice of different strains for donor and recipient mouse allowed the crossing of MHC barriers, facilitating the study of the immunopathology of OB. The loss of epithelium and the development of obliterative lesions in the allografts but not the isografts supported the hypothesis that this is at least in part an immune driven pathology. Epithelial denudation probably results from an alloimmune response, with increased expression of MHC class II antigens occurring on the allograft epithelial cells, causing them to be targeted. Several groups then compared different sites for tracheal allograft transplantation in the rat [15,16] and further work in the rat omentum model [17,18,19,20]. Boehler et al  conducted an elegant study in the rat examining the development of OB at 14 time points from 1 day to 1 year. Studying two different transplantation sites, the omentum and the dorsal subcutaneous pouch, they demonstrated a triphasic time course. The initial ischaemic phase (day 1 to day 7 with a peak at day 2) was seen in both allografts and isografts (a second ischaemic phase was seen in the allografts only, resolving by day 21). This was followed by a marked lymphocytic infiltrative phase (day 3 to a maximum at day 7, resolving by day 14) with complete epithelial denudation (allografts only by day 9). The third phase consisted of a fibrous obliteration of the airway lumen, in allografts only (in many cases complete by day 21). All allografts showed complete fibrotic obliteration by day 28. This study confirmed the immune-mediated nature of the lesion, because only allografts were adversely affected. It also suggested the occurrence of a progressive pathology in which immune-mediated epithelial injury leads to overwhelming lymphocytic infiltration, which then orchestrates the fibroproliferative response (see Fig. 1). It is important to note that no differences were seen between the pathology developing in the omentally wrapped isografts and allografts and that developing in those placed in the dorsal subcutaneous pouch. Because revascularisation would be expected to occur more readily in the omentally wrapped trachea than in the subcutaneous site, this suggests that, at least in this model, ischaemia might not be a major factor in the development of OB. This study validates the use of the subcutaneous pouch for future work, a method less traumatic for the animal and technically easier to perform. One possible drawback to this method might be the position of the transplantation site when handling animals for dosing. The study confirms a preliminary study by Huang et al  also demonstrating that development of the obliterative lesion did not depend on the site of transplantation. The study also showed an increase in T cells and class II MHC antigens, supporting the case for an immune-mediated injury. This led to an infiltration of macrophages, stimulating growth factors and leading to fibroblast proliferation and occlusion. Further work by Brazelton et al  removed the source of immune reactivity by retransplanting the trachea from the allogeneic recipient into an isogeneic strain of rat at 7 and 14 days after allografting. This demonstrated that tracheae retransplanted at 7 days did not become obliterated, whereas those transplanted at 14 days did occlude, thus showing that after a certain point lesion development will progress despite removal of the alloimmune stimulus. The work that followed was evenly distributed between those using the omentum and those using the dorsal subcutaneous neck pouch as a site for transplantation. The work with the omentum has been performed exclusively in the rat [18,19,20,21,22,23,24,25,26,27,28,29,30,31,32,33,34,35,36], whereas the subcutaneous site has been used in both the mouse [38,39,40,41,42,43,44,45] and the rat [16,46,47,48,49]. The mouse confers some extra advantages over the rat in that studies can be conducted in specific gene knockout or transgenic animals or those with severe combined immunodeficiency (SCID), affording the opportunity to dissect the mechanisms involved in the development of OB. The mouse also has a size advantage in that much smaller quantities of compound are required to screen potential drug candidates. Heterotopic transplantation has also been performed in larger animals, the pig [50,51,52] and the primate . In these animals bronchial tissue has been transplanted subcutaneously. Large animals enable the study of events in smaller airways including bronchioli, where the disease predominantly occurs in humans . These models might be useful in the study of the pathogenesis of OB, but their size, housing costs and availability preclude their routine use in drug screening programmes. The small animal models described above will provide useful tools for studying the pathology and processes involved in the development of OB and may provide a robust model in which to screen candidates for the treatment of OB. The main concerns when assessing methodology in these models are which species to use, which strains to use as donor and recipient and at what time point or points to assess the progression of the lesion and the effect of any treatment on that lesion. The majority of the work to date has been performed in rats and mice. It is important to select a donor and recipient that are mismatched in terms of their histocompatibility (see Tables 1, 2 and 3) because in the clinic it has been shown that MHC class I and II antigens are upregulated in grafts that develop OB [8,55,56]. This fact was emphasised by Kelly et al , who subcutaneously transplanted tracheae from BALB/c mice into C57BL/6 mice or SCID C57BL/6 mice. The pathology in the tracheae in the SCID mice was indistinguishable from that in isografts (BALB/c to BALB/c), whereas the allografted C57BL/6 mice had significant lesions. GFs, growth factors; IFN-γ, interferon-γ ; IL, interleukin; IL-2R, IL-2 receptor; iNOS, inducible nitric oxide synthase; n.r., not reported; PDGF, platelet-derived growth factor. GFs, growth factors; n.r., not reported. GFs, growth factors; IFN-γ, interferon-γ; IL, interleukin; IL-2R, IL-2 receptor; MCP, monocyte chemoattractant protein; n.r., not reported. In the rat, the trachea has been transplanted into the omentum or the subcutaneous neck pouch, whereas in the mouse all the published studies have employed the subcutaneous pouch. The published data tend to agree that in both rats [15,16,22,34] and mice [39,42] the time to complete tracheal luminal obliteration, regardless of the site chosen for allografting, is about 28 days after transplantation. The published data also agree that in most instances in rats [16,22] and mice  partial obliteration occurs at 21 days after transplantation. Therefore a tracheal allograft transplantation model in non-histocompatible mice or rats with harvesting at 28 days should provide a suitable model with which to study the development of OB. Earlier time points can be added to a study to determine the progression of the pathology. Later time points have been employed to determine the involvement of collagen and the development of luminal scar tissue [16,41]. A wide variety of end points have been measured in these models. Most studies determine epithelial coverage and luminal occlusion with an assessment of the inflammatory and proliferating cells involved. In some cases an assessment of collagen type and deposition has been performed. The pathology of the lesion has been studied in detail and the cytokine/chemokine profile, growth factors and the role of infection have been examined. The epithelium has been examined by standard histological techniques to determine the percentage of normal respiratory epithelium and the degree of ciliated epithelium. The degree of epithelial coverage is often measured and necrosis is assessed. Luminal occlusion has been estimated morphometrically using an ocular grid , or computed by image analysis  or graded using a scoring system [28,45]. Different groups have quantified the general pathology of the lesion by a grading system [15,45] or semiquantitatively by one experienced pathologist . These procedures have been performed by one or more observers blinded to the identification of the groups. Assessment of cell proliferation has been performed by using bromodeoxyuridine followed by treatment with an IgG1 antibody to identify the proliferating cells . Using these techniques, the identity of some of the factors and processes involved in the development of the obliterative lesion in the tracheal allograft model has been revealed. These are summarised in Tables 1, 2 and 3. With regard to pathology, several studies have described similar findings regardless of the animal or site of transplantation. All studies have compared the development in allografts with that in isografts. Hertz et al  have described the pathology at 10 and 21 days in the mouse subcutaneous transplant model. At 10 days they found inflammation, epithelial denudation or necrosis or epithelial abnormalities and early fibroproliferative changes. The inflammation was primarily subepithelial but in some instances it involved the peritracheal tissue. Lymphocytes and neutrophils were the predominant cell types found, and the presence of plasma cells was also observed. The isografts had normal respiratory epithelium and normal or near normal histology at 21 days. The allografts at 21 days demonstrated moderate to severe inflammation and luminal occlusion with the presence of vascularised, fibrous granulation tissue. Similar findings were observed in the rat subcutaneous transplant model [15,16]. At 14 days after transplantation, Reichenspurner et al  found epithelial loss, neutrophilic infiltration of the mucosa and submucosa and a marked mononuclear infiltrate mixed with plasma and eosinophils. Again, complete fibrotic obliteration was seen in the allografts by day 28. Adams et al  have demonstrated the importance of the epithelium in the development of OB. Using a rat tracheal isograft transplanted into the omentum, they removed the epithelium by protease digestion before grafting. The isografts developed luminal occlusion, an effect that was inhibited by reseeding with epithelial cells. Brazelton et al , transplanting from BN to Lewis rats, studied the change of phenotype as the lesion developed, with donor cells being replaced by recipient cells without significant loss of tissue organisation. They observed that all cells, including migrating mesenchymal cells, and connective tissue deposition within the graft were of a recipient (Lewis) phenotype by day 28. Huang et al  looked at the expression of antigens in graft tissue at days 14 and 28 and also at the expression of mRNA for PDGF and bFGF. They found that at both 14 and 28 days the macrophage antigens (ED-1 and ED-2), α smooth muscle cell actin, T-cell antigen, CD4+ and CD8+ T cells, interleukin (IL)-2 receptors, MHC class II antigens, proliferating cell nuclear antigen, PDGF mRNA and bFGF mRNA were all upregulated in the allografts in comparison with the isografts. Neuringer et al  demonstrated, in the mouse, at 14 days the presence of large numbers of CD4+ and CD8+ T cells and macrophages in allografts in comparison with isografts. They showed that the CD4+/CD8+ ratio at 14 days was 0.75 and that at 6 weeks it was 2. At 6 weeks in this study there was a predominance of macrophages and myofibroblasts [recipients in this study were treated with cyclosporin A (CsA) at 25 mg/kg per day intraperitoneally, 5 days per week]. In addition, Boehler et al  showed that beyond 28 days the luminal granulation tissue became less cellular and less vascular and showed increasing deposition of collagen for up to 1 year. Kallio et al  looked at the role of complement activation in the development of OB in the rat. They demonstrated an increase in the within-graft complement components C3 and C5b-9, the membrane attack complex, and also increases in IgM and IgG during the loss of epithelium and the development of airway occlusion in allografts. The cytokine profile in these models has also been studied. Boehler et al , using reverse transcriptase mediated polymerase chain reaction, have shown that the T-helper type 1 (Th1) cytokines IL-2 and IFN-γ were upregulated at 3, 7 and 21 days, whereas the Th2 cytokine IL-10 showed no change in allografts or isografts. They also demonstrated that the neutrophil attractant chemokine macrophage inflammatory protein-2 (MIP-2) was expressed early in the development of the lesion, whereas expression of the monocyte and lymphocyte chemoattractants monocyte chemoattractant protein-1 (MCP-1) and RANTES (regulated upon activation, normal T-lymphocyte expressed and secreted) increased with time. However, the increase in MIP-2 expression occurred in both isografts and allografts. Suga et al , studying the involvement of RANTES, showed that treating isografts with recombinant RANTES did not induce fibroproliferative airway obliteration despite increasing CD4+ T-cell migration. However, treating allografts with a neutralising anti-RANTES antibody reduced CD4+ T-cell influx and preserved luminal patency. In a preliminary study, Belperio et al  showed in the mouse that both MCP-1 and its receptor CCR-2 are upregulated in tracheal allografts and that this increase is correlated with monocyte recruitment. Neuringer et al  studied the T-lymphocyte cytokine gene transcription profile in allografts compared with isografts in the mouse model. It should be noted that all recipient animals were immunosuppressed (CsA, 25 mg/kg per day intraperitoneally 5 days per week) in this study. They showed that in the allografts the Th1 cytokines IL-2 and IFN-γ, the Th2 cytokines IL-4 and IL-10, and the cytotoxic lymphocyte product granzyme B were upregulated 2–10-fold throughout lesion development. The expression of the Th1 cytokines and granzyme B was greater than that of the Th2 products. The production of all these gene transcripts peaked within 2–4 weeks after transplantation, the period corresponding to the intense T lymphocyte infiltration in allografts. Although both Th1 and Th2 cytokines were shown to be upregulated in this study it did not preclude a protective role for Th2 cytokines in graft rejection. A preliminary study conducted by Takao et al  also showed exacerbation of the obliterative lesion by administration of IL-2. This produced an increase in peritracheal lymphocyte infiltration and accelerated luminal obliteration. Gu et al  also showed that IL-2 exacerbated obliteration in allografts even in the presence of CsA treatment but did not cause luminal obliteration in isografts despite causing epithelial loss and lymphocytic infiltration. 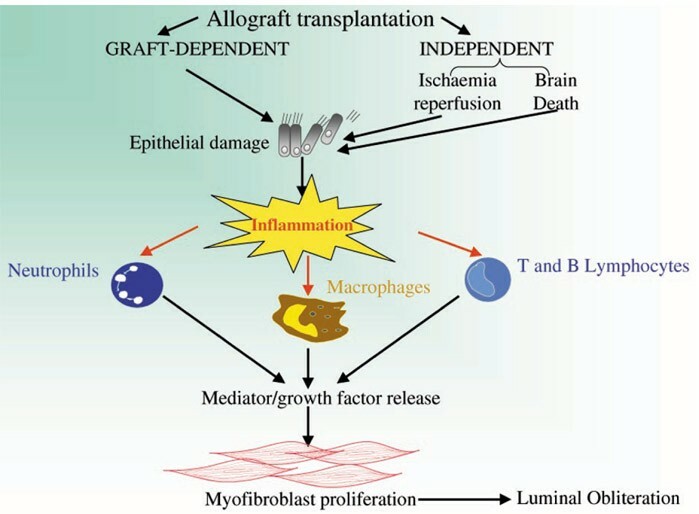 Al-Dossari et al  looked at the effect of the administration of growth factors in the mouse isograft model and showed that PDGF and bFGF administration produced a fibroproliferative lesion in isografts similar to that previously seen in allografts, demonstrating that OB can develop in the absence of an alloimmune injury. Kallio et al  used a combination of immunostaining, polyclonal antibodies and reverse transcriptase mediated polymerase chain reaction to determine the involvement of PDGF isoforms and their receptors in the development of OB in the rat tracheal allograft. They showed an increase in PDGF receptor α and β mRNA expression and an increase in PDGF-AA and PDGF receptor α immunoreactivity during the loss of epithelium and the development of the fibrotic occlusion, suggesting a regulatory role for PDGF in the development of OB. Conflicting results have been obtained regarding the role of nitric oxide (NO) in the development of OB. Kallio et al  suggested that NO might have a protective role, showing that by treatment with aminoguanidine, an inhibitor of inducible nitric oxide synthase (iNOS), proliferation was enhanced and the obliterative lesion was increased. They also showed that treatment with L-arginine, a precursor for NO, reduced the obliteration in allografts. However, Romanska et al  have suggested that NO might have a dual detrimental role. They demonstrated that iNOS expression is not only increased during the destruction of the epithelium but is also intense in fibroblasts as they undergo morphological changes during the early part of the fibroproliferative stage. However, iNOS expression is weak during the later occlusive phase of the lesion. This suggests a role for NO in the destruction of the epithelium and the stimulation of fibroblast activity. Three publications have looked at the role of rat cytomegalovirus infection in the development of the obliterative lesion in rat tracheal allografts [23,24,25]. Lemstrom et al  and Reichenspurner et al  showed that infection of the recipient but not the donor exacerbated the development of the lesion. Koskinen et al  showed that infection with rat cytomegalovirus enhanced the epithelial expression of MHC class II antigen and myofibroproliferation and suggested that these changes might be mediated by an increased expression of PDGF-AA and PDGF receptor α.
Pathological findings similar to those found in the rat and mouse models have also been reported in bronchial allografts in the pig [51,52,53] and the primate . This amounts to the current published knowledge of the pathology, cells, cytokines, chemokines and growth factors involved in the development of the obliterative lesion in the tracheal allograft model. This information might help in the identification of targets for drug intervention in the development of the lesion. The main emphasis of studies on drug treatment in these models has involved immunosuppressants. Other studies have examined the effects of compounds that interfere with growth factors or the synthesis and release of cytokines or chemokines. Various biological tools have also been used to elucidate the mechanisms involved. These studies are summarised in Tables 4, 5 and 6. *Toxic at this dose; CsA, cyclosporin A; DSG, deoxyspergualin; i.m., intramuscularly; i.p., intraperitoneally; MPA, mycophenolic acid; MPM, mycophenolate mofetil; n.e., no effect; n.r., not reported; p.o., orally; RPM, rapamycin; s.c., subcutaneously. i.p., intraperitoneally; n.r., not reported. Ab, antibody; Adv, adenovirus; CsA, cyclosporin A; GFs, growth factors; IL, interleukin; i.m., intramuscularly; i.p., intraperitoneally; n.a., not assessed; o.m.p., osmotic mini pump; PDGF, platelet-derived growth factor; rIL-10, recombinant IL-10; s.c., subcutaneously; sCR; soluble complement receptor; TNF, tumour necrosis factor. Immunosuppressive agents are known to forestall tissue rejection after organ transplantation by a variety of methods. Several studies have examined the effects of CsA, leflunomide (LFM), rapamycin (RPM), FK506, deoxyspergualin (DSG), mycophenolate mofetil (MPM) or mycophenolic acid (MPA) in the tracheal allograft model. Davreux et al  were the first to examine the effect of CsA in the model alone and in combination with methylprednisolone. CsA is known to inhibit the activation and proliferation of T lymphocytes and to inhibit cytokine synthesis and secretion. CsA showed a dose dependent preservation of the epithelium when tracheae were harvested at 14 days; this effect was increased by the addition of methylprednisolone. Koskinen et al  compared the effects of CsA, DSG and MPM. DSG is thought to suppress the actions of monocyte/macrophages  and inhibit lymphocyte proliferation , whereas MPM inhibits T lymphocyte and antibody responses and the production of macrophage-derived cytokines  by selectively blocking the de novo pathway of purine synthesis . CsA in this study decreased OB in a dose dependent manner, preserved epithelium and reduced inflammation, whereas MPM reduced inflammation but had no effect on OB. DSG reduced airway obliteration but did not preserve epithelium or reduce inflammation. In a preliminary study, Morris et al  compared five immunosuppressant drugs with different mechanisms of action: CsA, MPA, RPM, LFM and DSG. RPM is a macrolide that acts by inhibiting signal transduction events triggered by cytokines and growth factors that cause cell cycle progression from G1 to S phase , unlike CsA or FK506, which inhibit cytokine synthesis principally in immune cells . Treatment was started on day 0 or day 7 after transplantation and tracheae were harvested on days 14 and 28. When treatment was initiated on day 0, all drugs promoted the retention of epithelium and reduced airway narrowing; however, when treatment was started on day 7, RPM was far more effective at reducing luminal occlusion than both DSG and CsA. In another study with several immunosuppressants, in which tracheae were harvested on day 14, Morris et al  showed that treatment from day 0 to day 13 with RPM or LFM preserved the epithelium and reduced luminal narrowing and the loss of intact respiratory mucosa, whereas in rats treated with CsA or MPA, despite a reduction in luminal narrowing, the peritracheal tissue was thickened and the respiratory mucosa was absent or abnormal. Brazelton et al  also studied the effects of five immunosuppressants: CsA, RPM, DSG, LFM and MPA. Tracheae were harvested at 3, 7, 14, 21 and 28 days and stained with antibodies specific for Brown Norway or Lewis MHC class I antigens. They showed a progressive infiltration of Lewis mononuclear cells at days 3 and 7; by day 14 infiltrating Lewis mononuclear and mesenchymal cells entered the lumen and by day 28 all cells within the lumen were of Lewis origin. None of the treatments could halt the infiltration of Lewis recipient cells into the donor trachea; however, some treatments did maintain the presence of donor cells within the trachea. This preservation of donor tissue was correlated with the degree of inhibition of luminal obliteration. Adams et al , using the same five immunosuppressants, began treatment 0, 7 and 14 days after transplantation and harvested the grafts at 28 and 50 days. When treatment began at day 0, LFM, RPM and CsA prevented obliteration but only RPM was effective when treatment began on day 7. When RPM treatment was delayed until 14 days its beneficial effects were largely lost. In this study the compounds that preserved the epithelium or promoted the regrowth of epithelium were the most effective at preventing luminal obliteration. At 50 days after transplantation they showed that in each of the treatment groups, despite the continuation of treatment, the occluding lesion had progressed from that seen at day 28. This observation might reflect the situation in the clinic where OB progresses despite continued immunosuppressive therapy. A similar observation was made by Takao et al  in a preliminary study in which CsA treatment was stopped at 28 days after allografting and the lesion occluded within a further 28 days. This observation was confirmed by Gu et al , who also showed that IL-2 could accelerate the occlusive process despite the presence of CsA. Hashimoto et al  adopted a different approach to immunosuppression: they used minimal immunosuppression by giving FK506 (0.5, 1, 1.5 mg/kg/day i.m.) for the first 3 days after transplantation. FK506 has a similar profile to CsA but has a 100-fold greater potency . The grafts were harvested at 28 days, and FK506, at the top dose only, showed morphology that was similar to that of isografts. The use of minimal immunosuppression in the clinic would be highly desirable because the long-term administration of high doses of immunosuppressants is not without problems. Fahrni et al  showed in the mouse that RPM significantly inhibited luminal occlusion by fibroblastic tissue at 28 days even when treatment was initiated as late as 14 days after transplantation. RPM also inhibited macrophage and peritracheal mononuclear inflammatory infiltration. The beneficial effects produced by RPM might be due in part to its reported anti-proliferative actions. Nair et al  showed that it directly and dose-dependently inhibited DNA synthesis by human adult lung fibroblasts, which might explain its greater efficacy in vivo. Also in the mouse, King et al  demonstrated that CsA given from day 0 dose-dependently inhibited the fibroproliferative occlusion in allografts harvested at day 30 without reducing epithelial injury or inflammation. One other study with immunosuppressants compared MMF, FK506, CSA and vitamin E (α-tocopherol) in the rat . Although some of the data with immunosuppressants is conflicting, the general consensus is that although their effects are beneficial during the early stages of the lesion, this might not translate into a long-term beneficial effect. The dangers of prolonged use of immunosuppressive therapies, such as nephrotoxicity and increased susceptibility to infection, are well documented. Therefore the need for better immunosuppressants or alternative pharmacological interventions is great. Other pharmacological treatments that interfere with the cytokines, growth factors or other agents involved in the development of the obliterative lesion have been tested in the tracheal allograft models. Kallio et al  have shown that treatment with L-arginine reduced the obliterative lesion as well as increasing within-graft iNOS and NO production. L-Arginine also produced an increase in the Th2 cytokines IL-4 and IL-10, suggesting a protective role for NO. Kallio et al  have also examined the effect of CGP 53716, a protein-tyrosine kinase inhibitor selective for the PDGF receptor . PDGF has been shown to be a major mitogen for smooth muscle cells and fibroblasts . CGP 53716 was given alone and in combination with a suboptimal dose of CsA. CGP 53716 was administered 24 h before transplantation and tracheae were harvested at 3, 10 and 30 days. CsA at a low dose did not inhibit tracheal occlusion, whereas CGP 53716 alone and in combination with CsA significantly inhibited the development of OB. CGP 53716 did not affect airway wall inflammatory cell proliferation, the number of infiltrating CD4+ or CD8+ T cells, ED3+ macrophages, IL-2 receptor expression or MHC class II expression. The role of angiotensin in OB has been examined in the rat by MacLean et al . Angiotensin II is thought to have a role in the development of fibrotic diseases; it has been found to have growth-promoting properties through smooth muscle cell hyperplasia, fibroblast proliferation, transformation to myofibroblasts and extracellular matrix deposition . These effects are thought to be mediated by the upregulation of transforming growth factor β1. The angiotensin-converting enzyme inhibitor captopril was given from 5 days before transplantation or 1 or 5 days after transplantation. Captopril given from 5 days before or 1 day after transplantation significantly inhibited airway obliteration assessed at day 21. When administered 5 days postoperatively, captopril was without effect. Further preliminary data from the same group  examined the effect of losartan, an angiotensin-1 receptor blocker. Administration began on postoperative day 1 or 5 and grafts were harvested on day 21. When treatment started on day 1, losartan was without effect, but when started 5 days after transplantation it significantly reduced airway obliteration. This paradox might involve transforming growth factor β1, which has been shown to possess immunosuppressive properties during the early part of the response to injury  and to have fibroproliferative effects later on . This axis is clearly worthy of further investigation. Boehler et al  examined the effect of the anti-inflammatory cytokine IL-10 in the rat tracheal allograft model. They administered IL-10 by adenoviral gene transfer or in recombinant form, showing that IL-10, regardless of the method of delivery, inhibited the development of airway obliteration assessed 21 days after transplantation. However, as in the losartan study described above, the treatment was effective only when started 5 days postoperatively and not when started immediately after transplantation. Another interesting feature of this study was that treatment with IL-10 did not preserve the epithelium or significantly affect lymphocytic infiltration in allografts examined at 7 days. One reason suggested for this observation is the time taken for the graft to revascularise and the fact that IL-10 was administered at a site remote from the graft. They further suggested that because IL-10 inhibited the fibroproliferative response despite the absence of an epithelium, it might provide a suitable treatment in situations where the epithelium is already damaged or missing. Boehler et al  have studied the role of tumour necrosis factor-α (TNF-α) in allograft transplantation by the use of gene knockouts in mice. They transplanted into animals with a single knockout for TNF-α or a triple knockout for TNF-α, TNF-β and IL-6. Grafts examined at day 21 demonstrated that in the single TNF-α knockout the airway obliteration in the allogeneic group was abolished and inflammation was reduced, whereas in the triple knockouts the obliteration was inhibited but an intense inflammatory response was observed. Kallio et al  showed that blockade of complement by human soluble complement receptor type 1 (sCR1), an inhibitor of the classical and alternative complement pathways, significantly reduced epithelial necrosis, neutrophil infiltration and airway obliteration. Grafts were removed on days 3, 10 and 30 and showed a reduction in IL-8 and intercellular cell-adhesion molecule (ICAM-1) expression, and an upregulation of IL-10 with subsequent downregula-tion of IL-2 and TNF-α. However, sCR1 did not affect T-cell or macrophage infiltration or the expression of IL-2 receptor-α or MHC class II antigens. They therefore suggested that treatment with sCR1 might shift the T-cell response from a Th1 type response towards a Th2 type response, thus producing an anti-proliferative cytokine profile. Another approach reported by Gammie et al  involved the preparation of mixed allogeneic chimeras by reconstituting lethally irradiated WF recipient rats with a mixture of T-cell depleted syngeneic (WF) and allogeneic (ACI rats) bone marrow cells. Mixed chimerism was present in all animals 28 days after transplantation. Donor-specific or allogeneic tracheas were implanted and harvested at 30 days. Mixed allogeneic chimerism was shown to induce donor-specific tolerance and prevent the obstructive lesion across major and minor histocompatibility barriers. The authors suggested that this might provide a useful strategy in the clinic if a low-risk conditioning regimen could be developed. Szeto et al  have adopted a similar approach in mice and suggest that the development of OB is dependent on donor-specific antigen-presenting cells and occurs in the absence of MHC class I or class II antigens. They suggested that either CD4+ or CD8+ direct allorecognition is important in the development of obliterative airway disease. Yamada et al  examined the effect of treating allografted mice with CTLA4 IgG. CTLA4 is a T-cell activation molecule and blocking its action interferes with the interaction of CD28 and B7, which provide a critical co-stimulatory signal for T-cell activation and proliferation against alloantigens . They showed that treatment with CTLA4 IgG markedly reduced luminal obliteration in allografts, suggesting that this process is T-cell dependent. However, treatment with CTLA4 IgG did not prevent the replacement of normal columnar respiratory epithelial cells by flattened attenuated epithelial cells and did not induce donor specific unresponsiveness. The authors suggested that these results demonstrate that luminal obliteration and epithelial loss represent distinct disease processes. In this review we have summarised the development of the tracheal allograft model. We have detailed its pathogenesis, its potential to provide information about a variety of end points and its usefulness as a system in which to test interventions aimed at treating the chronic condition OB that occurs after lung transplantation. It would appear that, although much remains to be discovered about the mechanisms of acute and chronic rejection and the development of OB, a model like the tracheal allograft has much to offer in terms of defining the pathogenesis of the disease and elucidating the cellular and molecular processes involved in its development. The model has been shown to share many of the characteristics of OB in the clinic in that heterotopic tracheal allografts exhibit epithelial damage, lymphocytic infiltration, low-level airway wall inflammation, with subsequent proliferation of myofibroblast-like cells, and gradual occlusion of the airway lumen. During the early phase the respiratory epithelium of the allografts strongly expresses MHC class II antigens, allowing the direct presentation of antigens to alloreactive T cells. The recruitment of CD4+ and CD8+ T cells and macrophages into the airway wall induces cytokines and growth factors derived from T cells and macrophages, leading to myofibroproliferation and OB. Although much work has already been performed to characterise the model and to determine the cells, growth factors, cytokines, chemokines and other factors involved in the development of the obliterative lesion, much more needs to be done to complete our understanding of the mechanisms involved. The tracheal allograft model in small rodents appears to present a viable, less technically demanding alternative to whole lung transplantation in these species. The ease with which these studies can be performed should permit a speedier resolution of the mechanisms involved in the development of OB. This furthering of our knowledge may lead to the identification of new treatments that could prevent, suppress or halt the progression of post-transplantation OB in the clinic. We acknowledge the support of The Harefield Trust and The British Heart Foundation.